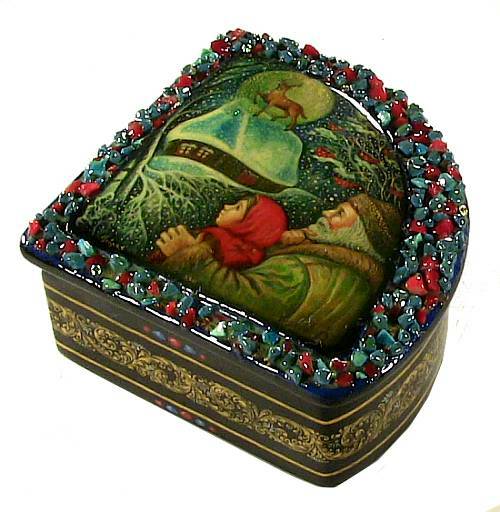 Beautiful turquoise and scarlet stones frame this scene taken from the Russian tale of Silver Hoof. Palekh artist Tatyana Smirnova shows the moment when the magical deer appears out of nowhere, stamps his hoof, and jewels fall down to the ground. The owner of the house and his daughter witness the event and, in fact, are able to gather and keep the new found wealth. 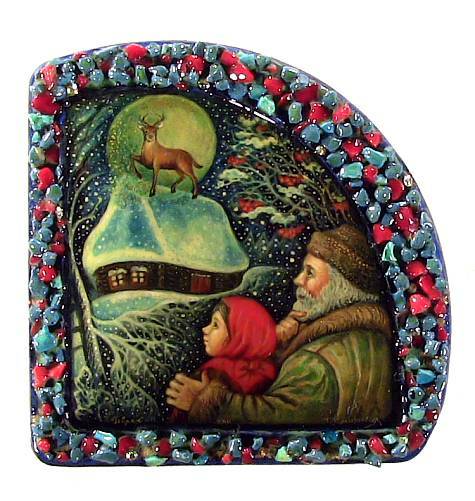 Smirnova paints a very warm wintry scene with intricacy and festive touches. 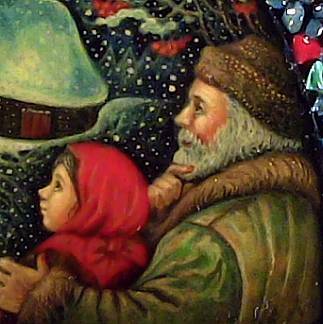 The jewels falling from the roof are depicted with specks of glitter. Tiny dots of snow throughout accentuate further the winter atmosphere. The triangular shaped box has a lovely gold ornament on the sides. The box is made out of high quality papier mache and stands on four small rounded legs. There is a hinge at the left. Signed with the name of the artist, village and year. Smirnova's initials (TS) are drawn in gold on the bottom.